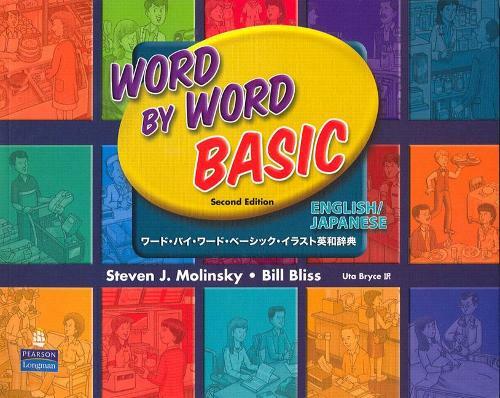 Word by Word Basic English/Japanese Picture Dictionary, Second Edition, by Steven J. Molinsky and Bill Bliss, is the only truly communicative vocabulary development program. Word by Word Basic is famous worldwide for its ease-of-use, lively spirit, and active conversational approach. The program's unique interactive methodology makes vocabulary learning come alive as a dynamic, communicative experience! Vibrant illustrations and simpleaccessible lesson pages with large type are designed for clarity and ease-of-use with learners at low-beginning and literacy levels. Word by Word Basic is the most learner-friendly picture dictionary. More than 2,500 essential words prepare students for success using English in everyday life, in the community, in school, and at work. A careful research-based sequence of lessons integrates students' development of grammar and vocabulary skills through topics that begin with the immediate world of the student and progress to the world at large. Expanded discussion questions encourage students to relate vocabulary topics to their own lives, experiences, and opinions. The English/Japanese Edition presents the second language in blue next to each English word. A monolingual English version is also available.The Teacher's Guide and Lesson Planner with CD-ROM includes lesson-planning suggestions, community tasks, Internet web links, and reproducible masters. A Vocabulary Workbook feature motivating vocabulary, grammar, and listening practice (Audio CDs included). A Lifeskills Workbook provides standards-based activities and reading tied to major curriculum frameworks. A Literacy Workbook offers fundamental practice with the alphabet and basic reading and writing skills for pre-Beginners (Audio CD included). The Audio Program includes all words and conversations for interactive practice and - as bonus material - an expanded selection of WordSongs for entertaining vocabulary practice through music. Color Transparencies and Vocabulary Game Cards are ideal picture resources for introducing, practicing, and reviewing vocabulary. The Testing Program and ExamView CD-ROM provide effective tools for assessment of student progress.